Dementia. It's one of the most dreaded conditions we face as we age. Many people claim they would rather be diagnosed with cancer than dementia or Alzheimer's. What many don't realize is that dementia is not a forgone conclusion as we get older. Our own lifestyle choices and habits can have a significant impact--for good or ill--on our chances of developing the disease. And that means there's hope. 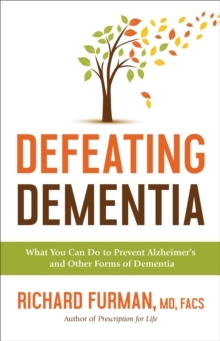 Drawing from the latest medical research, Dr. Richard Furman helps readers understand dementia and Alzheimer's and shows them how to make three powerful lifestyle changes that can help decrease the probability of developing this disease. He explains how eating the right foods, exercising, and sustaining an ideal weight can dramatically reduce the likelihood of developing dementia in the first place, and even how it can slow the progression of the disease in someone who has already received a diagnosis.